Hypnotherapists have been helping their clients to stop smoking, drinking, using drugs, and find the root of their suffering for years. The subconscious mind is so fascinating in that we alone have the solutions to our problems and can stop the addictive urges. For many individuals that I see, they do not subscribe to the 12-step model for a variety of reasons. Maybe they’ve tried it before and it did not work for them. This is the point at which clients find me-when the hope has run out and they just need relief. It still surprises me every day that a technique as simple as hypnotherapy can help a person quit a 20 year smoking habit, or stop the vicious cycle of binging and purging. Hypnotherapists use techniques that address triggers In the brain, stop self-sabotaging issues, identify the WHY behind the pain, release trauma, and redirect the neural networks in the brain. When I started applying hypnotherapy to address addiction, I found the addictive behaviors frequently stopped and the fear of relapse was often gone. I do think for some, 12-step programs are incredibly helpful and I support my clients in whatever decision ( is aligned with their recovery goals) and will help with their recovery. But when someone says, “I’m Betty and I’m an Alcoholic,” it forces the mind to focus on all the weakness and fear involved with identifying oneself as an addict. The negative memories and connections are constantly being reinforced by repetition. When a hypnotherapist helps a client, we start by changing the identity and beliefs that are causing the problem and create a new identity about who the client is now. A hypnotherapist will work on the client’s core issues such as memories or beliefs that make the person fearful or ashamed. Since I am in the business of eliminating shame to help individuals find hope and recovery, this powerful intervention has been a lifeline for me and my clients – a beacon in the middle of the turbulent, stormy sea. When the goal of the client is to experience a life free from drinking, drug use, disordered eating, or smoking, they go on a journey to meet their future self. The client will feel what it’s like to be free from addiction. His or her subconscious mind will incorporate new beliefs, new self-compassion, self-worth, and purpose. If You Fire It, You Wire It! Back in my Psychology 101 days, we learned an important lesson on neuroplasticity. If you fire it, you wire it. The neuroplasticity of the brain allows hypnotherapy to form new neural connections. In the past, situational triggers (e.g. passing by one’s favorite watering hole) would lead to cravings and make it very hard not to drink. With hypnotherapy, we can actually rewire the response that the brain has to the sight, smell or thought about alcohol (or any other drug for that matter) forcing the mind to trigger a new feeling. The thing that would cause triggers and relapse, now is reinforcing the commitment to not drink. 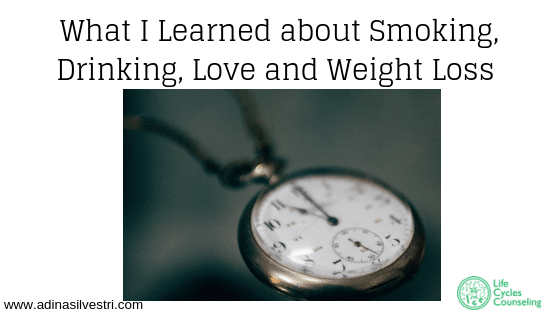 What I learned about smoking, drinking, love and weight loss can be summed up in two words: rapid relief. And what follows is the freedom from thinking you are never going to quit this habit. Hypnotherapy is a positive experience that changes everything you think you know about addiction and really has you focus on your future self. You will find hope and recovery! And it may be as simple as a walk inside the landscape of your mind. If you are interested in learning more, click here. If you liked this blog, read more here!